Former Leitrim footballer Colin Regan was the special guest on the Talking GAA show this week. Dave was also joined by GAA fans across the country. Our Cork natives, Donal and Graham joined Kerryman Eoin along with Armagh’s Damian to discuss a wide range of topics this week. Off the Booze and On the Ball. The future for colleges tournaments. 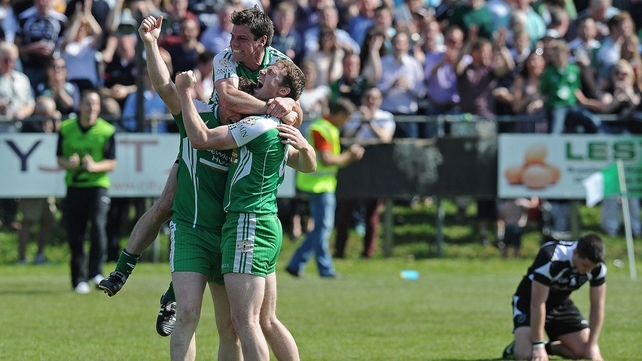 Is the GAA becoming a total young man’s games? Dr Crokes play Crossmaglen in the All Ireland club football semi final. Talking GAA is by the fans for the fans. If you would like to be involved, please drop us an email toTheWorldsTalking@gmail.com. You can subscribe to us also on iTunes. Talking GAA with Dave O’Grady. Dave is joined by two rebel fans, Donal and Graham, Kerryman Eoin and David from Meath. Managers on the move – The lads discuss Peter Canavan’s appointment as Fermanagh boss and wonder what will become of Leitrim after Mickey Moran. There is fierce debate over the Munster Club Hurling final replay being played in Thurles. How good are St Brigid’s of Dublin, as they prepare for a Leinster Club SFC semi-final showdown with Portlaoise. Dave also looks ahead to Athy’s match with Garrycastle. As always, there is the Bet of the week. Talking GAA is by the fans for the fans. If you would like to be involved with the show drop us a mail to TheWorldsTalking@gma il.com. You can also subscribe to the show on Itunes . We have a packed show this week with the recent inter-county retirement of Kilkenny hurler James ‘Cha’ Fitzpatrick. Dave is joined on the line by Emmet from Action81.com, the Kerry duo of Eoin and Ailbe (what a great name) and our rebel fan Graham from Cork. The recent inter-county retirement of James ‘Cha’ Fitzpatrick. Unsavoury scenes as St Brigids take the Connacht title. UCC set up tasty encounter with Dr Crokes, but should UCC be called ‘UCK’. The Railway Cup is back on track. Dublin unleash the ‘Blue Wave’. What has happened to Meath football? Our bet of the week. Remember Talking GAA is by the fans for the fans. If you would like to be involved in the show, simply email us at TheWorldsTalking@gmail.com and if you like the show, don’t forget to click ‘like’ about on Facebook, Twitter, Google plus etc. Graham from Cork makes his debut on the show and he is joined by Eoin from Kerry and Action81.com’s Emmett Ryan. 20.22 Jimmy Barry-Murphy’s in the Cork hotseat. If you would like to comment or be involved with the show, simply drop us a mail to TheWorldsTalking@gmail.com. Dave is joined by Eoin in Kerry and Emmet of Action81.com. 0.00: St Brigids are Dublin champions. 6.30: International Rules, was it a success? This is the first episode of the series where we get the views from the fans about all things GAA. We hope to cover all GAA sports. Joining Dave on the first show is Stephen Long of Beat Fm and Emmet Ryan of Action81.com. If you want to be involved in Talking GAA with Dave O’Grady you can mail us at TheWorldsTalking@gmail.com.